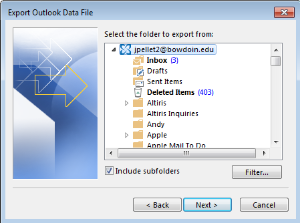 How do I export my email and contacts to a file so I can import the information into another version of Outlook and access it after my Bowdoin email account is closed? The following instructions apply to Outlook 2013 and 2016. If you need assistance accessing a shared calendar in an earlier version of Outlook, please contact the Service Desk at x. 3030 for assistance. 1. In Outlook, click File. 2. Click on Open & Export. In the right pane, click the Import/Export button. 3. 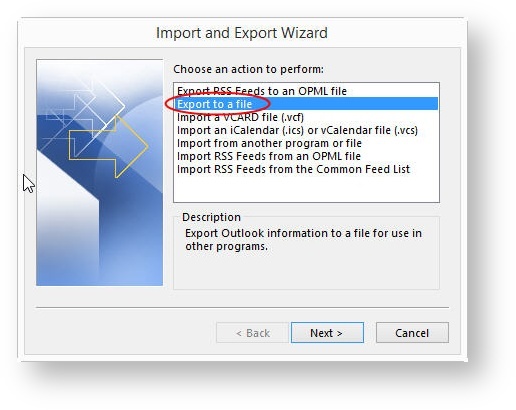 In the Import and Export Wizard window, select the Export to a file option, then click Next. 4. Choose the mailbox that you'd like to export and click Next. Be sure to select the correct mailbox. 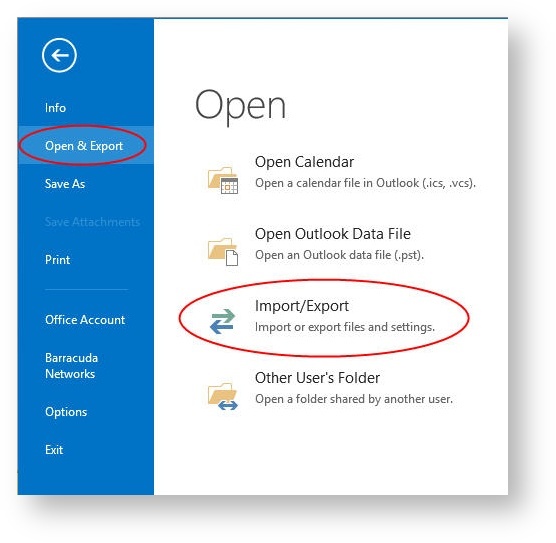 If you have more than one account added to your Outlook client you would be given the opportunity to export any of them. Scroll through the list to make sure that you're selecting the mailbox. 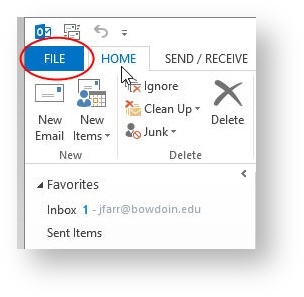 The Bowdoin mailbox should be identified by your email address. 5. 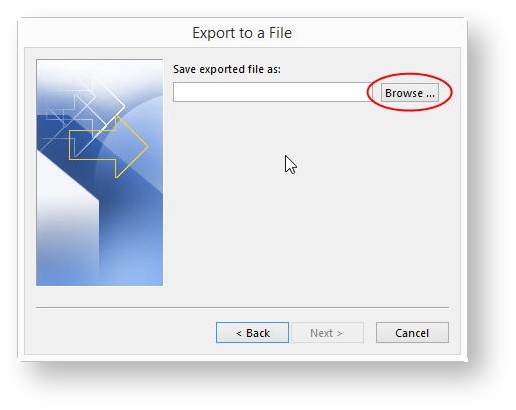 Under Save exported file as, click Browse to select a destination folder. 6. In the File name: box, type a descriptive name for your contacts file, then click OK.
8. Complete the process by clicking Finish. You have now exported your email and contacts to a file that will allow you to migrate the mail to another version of Outlook and/or keep an archive copy for future reference if needed. For those who use contact groups, please be aware that the individual contacts in your address book will be included in the export but your contact groups will not. If you use contact groups, please make a note of them prior to migrating so that you can more easily re-create them.